Sophomores Ananda Collins, Jasmine King and Jordan Jefferson were amped after recently returning from the 18th annual Public Policy and Leadership Conference at Harvard University’s Kennedy School of Government. Collins, King and Jefferson were among 73 students chosen from more than 800 applicants to attend the conference on a fully funded scholarship. The students agreed that they learned a lot and were inspired by the trip. “I met some interesting people that really motivated me,” said the normally reserved King, who used the trip as a chance to step out of her comfort zone and engage with others during networking events. While at the Harvard Kennedy School campus, the trio of poli sci majors was able to attend graduate-level courses and inquire about the graduate school admissions process. They also received information about various fellowships that could fund their graduate studies, such as the Public Policy and International Affairs Program, the Charles B. Rangel International Affairs Program, the Harry S. Truman Scholarship Foundation and the Sheila C. Johnson Fellowship. Collins admits that she has newfound confidence about getting into top graduate school programs after learning that the Kennedy School has a 20 percent acceptance rate in contrast to the 9 percent who were selected to attend the conference. “It is definitely possible,” she said. 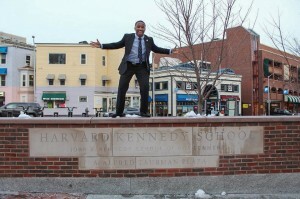 For Jordan, the trip moves him “a step closer” to attending Harvard for graduate school he said, after recalling the rejection letter he received after applying to the Ivy League institution during his senior year of high school. The conference included prominent speakers who hosted workshops about the importance of public service, moral ethics in governing, and the development of a narrative as a future public servant. King said the workshop about moral philosophy was interesting and it opened her eyes to things she had not foreseen. She also expressed gaining a better understanding as to how leaders have to make tough decisions with moral ethics as their guidance. When asked about their favorite moments at Harvard, their overall consensus was meeting the members of their cohort, as well as the faculty, staff and graduate students of the Kennedy School of Government. “They (cohort members) asked really great policy questions, and these are 19 and 20-year-olds who are really concerned about the policy of today’s world,” Collins said before expressing how moved she was by their display of concern for marginalized communities. “My favorite part was meeting people and hearing their stories about what they want to achieve and how they’re going to do it,” said Jefferson, also pointing out that he was able to relate to the diverse cohort of student leaders and activists from across the nation. Now back on campus, they are still determined to achieve their goals. Collins wants to become a researcher on social and human behavior. King intends on becoming a lawyer and creating a non-profit dedicated to empowering young black women. And Jefferson also plans to have “esquire” behind his name and later work as a legislator who will serve the state of Mississippi.